I had a dream about you last night! Congratulations! You deserve this...your insights, information and resources are so needed. CONGRATULATIONS, Rixa! What an honor. 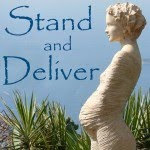 By the way, the "stand and deliver" button in this post--may we use it to put in our blog sidebars to link back here? Oh Rixa. Congratulations! What an amazing arrirmation of your approach and your passion. Well done you! You definitely deserve it. Your kids will definiety look back at their with immense pride adn recognise what an amazing mother they have. Thanks for your passion, it give a much needed voice in the bussiness world of birth. Congratulations! It is a well-deserved honor. I have greatly enjoyed and benefited from your posts and the discussion here in the comments section. Keep up the excellent work! congrats! You deserve the award and I so enjoy your insights! CONGRATULATIONS!! A well-deserved recognition! I may have to drive a couple of hours northeast to see you accept it! Congrats! You certainly deserve the award! Congratulations, Rixa - this is much-deserved. You definitely deserve it. Yeah! congratulations! Well deserved for your thoughtful and learned dissection of the issues around childbirth. Congrats!!!!!! Amy Romano is awesome isn't she? I am so lucky to live in the same birth community as her and be able to meet and spend time with her. What a great accomplishment for you! Soak it up! Congrats Rixa! I thoroughly enjoy your blog. Not only is it a great resource, but you write with integrity, thoughtfulness and respect. You are helping to make birth better and we need more people like you! Well-deserved, Rixa. I send people here for info all the time...congratulations! Congratulations - so well deserved! I often share your posts and I know that your info does a lot to open hearts and minds about birth. Have a great time in Orlando.Thanks for sharing with us regularly and with tremendous generosity. If you can figure out how to make the button link, sure, go for it. I suppose it probably isn't too complicated but I haven't learned how to do that yet. And if you develop html code for it, please let me know so I can put it up on this blog for others to use. Congratulations! You have a great blog, I love reading it everyday. Keep going! WOW!!!! Congratulations, Rixa! This is so awesome. I am very proud of you! You totally deserve this. Congratulations! I so love your blog. Whenever I read something negative about natural childbirth or homebirth and feel discouraged, I just come to your blog and read something awesome and feel reassured that someday I can have a natural birth! Congratulations, Rixa!!!! I'm thrilled for you. I remember reading and enjoying your first posts and I've enjoyed it all since, too. You have a wonderful blog! Congrats! What a great interview. Congrats Rixa! I love reading what you write, and love having the chance to chat along with you once and I while! Congratulations, Rixa! I'm so glad I found your blog several months ago. :-) Carry on! Carry on! Carry on! I'm late to the party, but had to add my congratulations. You're an inspiration in so many ways. So glad to see Lamaze recognize what all of us loyal followers saw from the first time we discovered your blog!